Since we announced F1™2015 back in April, one of the most frequently asked questions we get is the supported controller and wheel list for the game. Today we’re pleased to share the full list of compatible wheels and controllers for all platforms; PlayStation 4, Xbox One and PC. 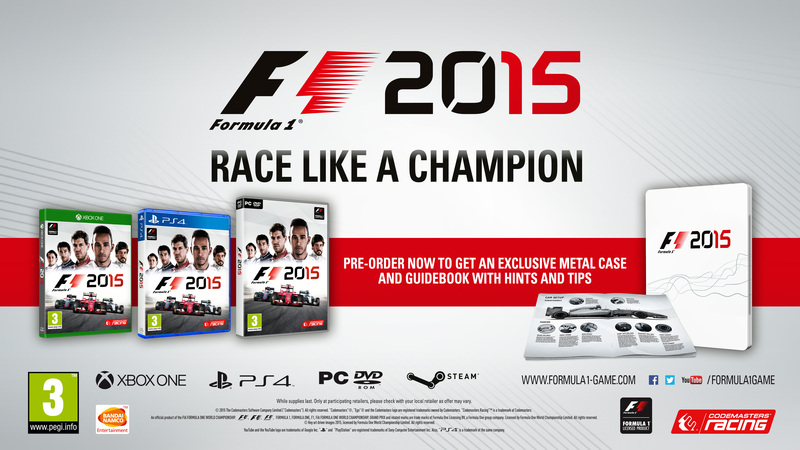 Pre-order F1 2015 today to receive an exclusive Metal Case and Circuit Guide alongside your copy of the game. All versions of F1 2015 will feature the same content including the 2015 FIA FORMULA ONE WORLD CHAMPIONSHIP season and, as bonus game content, the fully playable 2014 FIA FORMULA ONE WORLD CHAMPIONSHIP™ season. The 2015 content on disc at launch will be based on the winter test/pre-season liveries as revealed by the teams before the season started. As the season progresses we’ll continue to deliver content based on the full season liveries and enhanced performance data. F1 2015 will release in the UK, Europe and Australia on July 10th, North America on the 21st and Brazil on the 24th. Head over to Formula1-game.com now for more information. Codemasters Community Manager. Man of Great Height. Drinker of Tea.